In real life, I work for a big financial services organisation (we’re not a bank, just let me make that clear before anybody clicks away in disgust. We try to look after people). In common with lots of other organisations, we use Indian resource to help us do cool stuff in IT quickly, and that means that we’ve got quite a number of Indian techs and programmers over here helping to get things done. They’re lovely people, highly skilled and knowledgeable, friendly and open, and they’ve brought their traditions with them from the distant sub-continent to the middle of Leeds. Diwali is a huge event these days. One thing that’s quite noticeable is the way our Indian contingent approaches lunch. Where most other people wolf down hastily bought sandwiches, hunched over a PC, feeling guilty for reading the news for ten minutes rather than working, our Indian friends make lunch an event. Out come little pots of curries and pickles, dhals, pakora, rice, all heated up in batches in the microwave and placed in the middle of a round table, around which six, seven, eight people will gather, tearing off pieces of chapatti and paratha, eating their communal meal thali style. It’s just something that happens, the way that people in India have lunch, and I often think that we should learn from them, rather than just buying limp sandwiches from the Sainsbury’s round the corner. The most admirable thing is the care that’s taken over food. These are not thrown-together-from-leftover affairs, because, as Carolyn Caldicott notes in her excellent book Bombay Lunchbox, “in India food cooked at home with care and love is considered to deliver not only healthy (and relatively cheap) food but also divine contentment”, and who couldn’t do with a little divine contentment to set them up for a hard afternoon at work? Bombay Lunchbox is a very timely book, with Indian snack food riding a wave of popularity (note the success of the utterly fantastic Bundobust in Leeds, packed out every night), and it’s also interesting and absorbing, with excellent street photography and plenty of Indian lunch classics, from aloo gobi to chana masala to bhel puri. The photos of bicycles heavily laden with steaming hot tiffin tins show Indian enterprise and ingenuity at its best, for there’s surely no greater feat of convenience and practicality than the tiffin tin, a series of tightly interlocking tins and trays that can be locked together with a handy carrying handle, then exploded outwards when it’s time to eat, so that four or five different foods can be carried together simply and easily. I really need to get one of those, and replace the rubbish plastic boxes that I use to transport my sub-standard lunches into work. Caldicott includes a chapter of Anglo-Indian recipes, the recipes from the era of the Raj, when Indian food started to slowly trickle back to India, and British ideas about food started to take hold in India. In many ways, these hybrid recipes are the most interesting, and they’re the ones that have left an indelible mark on British culture to this day, echoes of Empires long gone, little reminders of how inextricably linked we Brits are to our Indian friends. 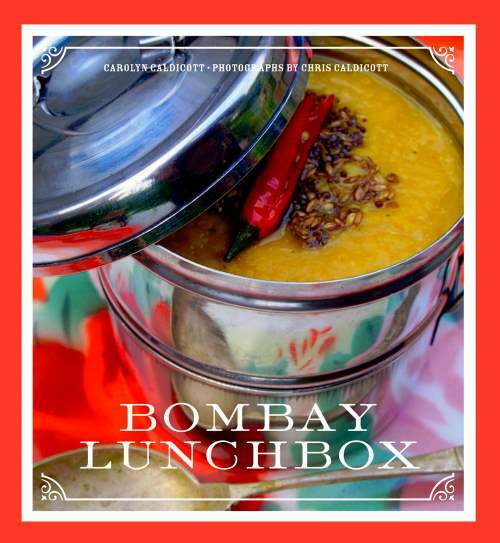 Bombay Lunchbox is a recipe book that’ll help anybody do lunch properly, Indian style.